Although inflation rose to a seven-month high in September, it was within the comfort zone for China's economy and will not lead the government to revise its reform policies, economists said. The National Bureau of Statistics reported on Monday that the consumer price index, the main gauge of inflation, increased 3.1 percent year-on-year in September, compared with 2.6 percent in August. The figure is higher than the average of 2.8 percent forecast by financial institutions. However, Qu Hongbin, HSBC co-head of Asian economics research and greater China chief economist, said the September figure is still lower than the alarm line of 3.5 percent. 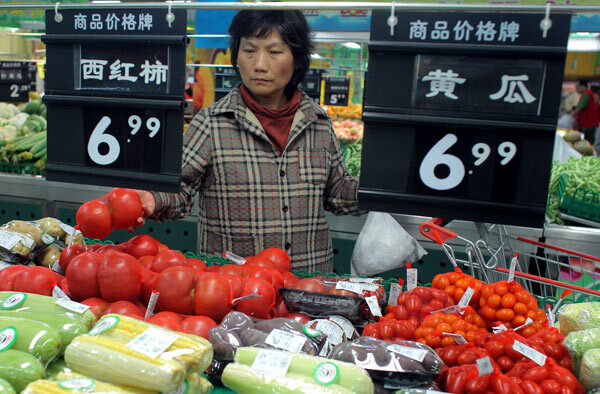 In the third quarter, China's CPI averaged 2.8 percent, compared with 2.4 percent in the first and second quarters. Most noticeably, food prices, which account for about 30 percent of the CPI calculation, grew by a 16-month high of 6.1 percent in September from a year earlier, which the bureau attributed to strong seasonal demand and disruptive weather conditions. Non-food prices increased by 1.6 percent year-on-year, compared to 1.5 percent in August, the bureau said. Tang Jianwei, a senior economist at the Bank of Communications, predicted that the CPI is likely to continue rising in the fourth quarter. "CPI growth in October to December will be moderate as domestic demand has not largely rebounded, food prices may maintain a benign rise, and there is less imported inflation," Tang said. In September, the producer price index, an indicator of industrial production inflation, declined 1.3 percent year-on-year, compared with a 1.6 percent decrease in August, thanks to moderate improvement in domestic demand, the NBS said. "With PPI having remained in negative territory for 19 consecutive months, upstream price pressure will continue to be manageable," said Ma Xiaoping, an HSBC economist. JPMorgan Chase & Co forecast that the full-year CPI is likely to stand at 2.7 percent, much lower than the government's target of 3.5 percent.